Here's what rouge developer Phil Hartwig has done to a huge chunk of hillslope, 18 kms north of Cairns, looking towards Palm Cove. The massive amount of vegetation that has been stripped, was documented on CairnsBlog video and woke the Council up to some serious environmental breaches. This photo was snapped just a few days ago, approaching the shoreline. This is absolutely disgusting. 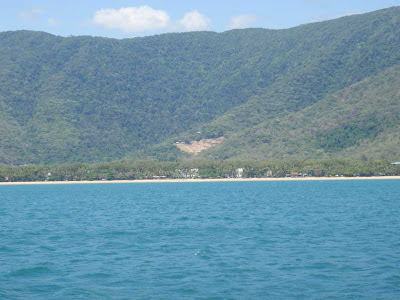 I noticed the clearing to start above Palm Cove mid this year whilst I was out sea kayaking off the coast. It was funny how whilst I was out at sea I could see both the obvious clearing at False Cape which exceeds the 80m AHD contour and the new clearing going on at Palm Cove. Whoever is responsible for allowing this to happen should hang their heads in shame. So much for our highly prized green backdrop to Cairns which has been an asset for tourist appeal. Our backdrop is now a liability.! With developers like this, who needs the US airforce? It's really a lot MORE scary than this appears. Keep in mind Hartwig's land is only 5 hectares. The surrounding property, owned by Melbourne developer Andrew Buxton and his family, is over 30 hectares. They have been actively supporting Hartwig's environmental vandalism because, once he's done, they will ram thru their project as well with Hartwig as the "precedent". There is little question that when the rains come, this whole hillside comes down. It will likely take with it Hartwig's unpermitted and unfinished shack, and hopefully the Buxton house (known as "Sapphire Ridge" as well.